Woke to 12 texts from Tom Brady, he wants to make plans to hang out next week but I’m like: Tommy, guy, I know it’s your off season but I have a business to run and a lot of other people in my life that need one thing or another. I think he got it and I feel kinda bad, so I asked Gronk give him a ring later. A work in progress. Looking out at the sunken sandbar that is Tahiti Beach this morning, I’m happy to see zero boats and zero people on our swim course. Breakfast first. Chef Miriam gets coffee going early, then a spread of yogurts, granola, fruit, hard boiled eggs, breads and jams. 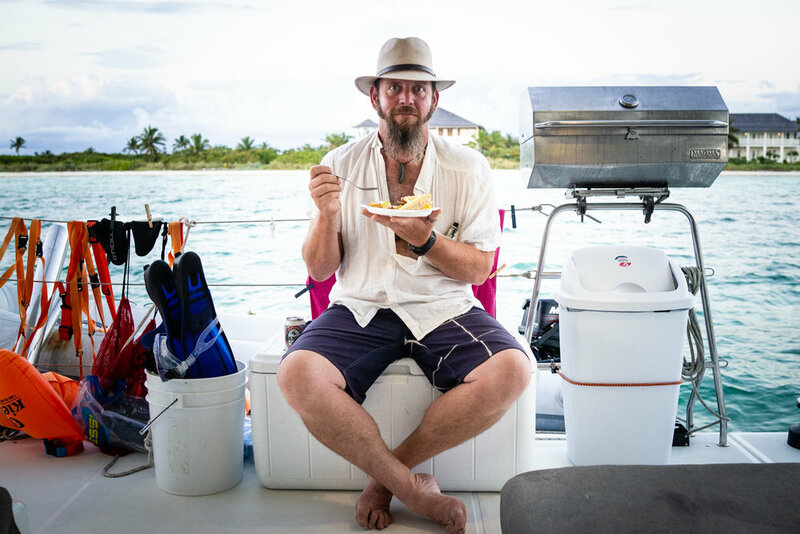 Swimming and eating is a tricky and personal thing in regards to timing and quantity, so we keep the spread out until well after our morning swim. 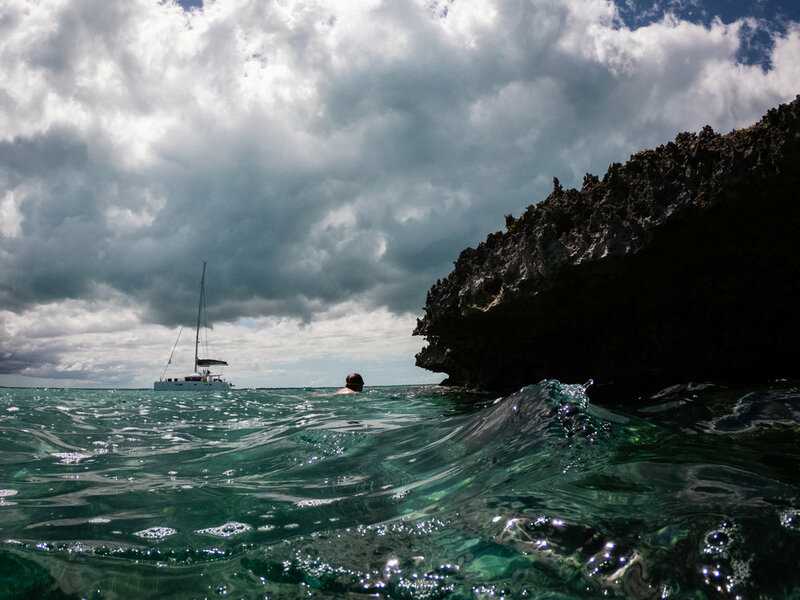 Guide Simon led Tara, Rick, and Cecile past the sandbar and into a bay that rubs up against the Atlantic, waves splashing over a reef on the east side. I watched from atop our standup paddleboard (SUP), watching over them, as well as Yafa and Miriam, with a good view of Lexi and Marianne guided by Heather behind us. 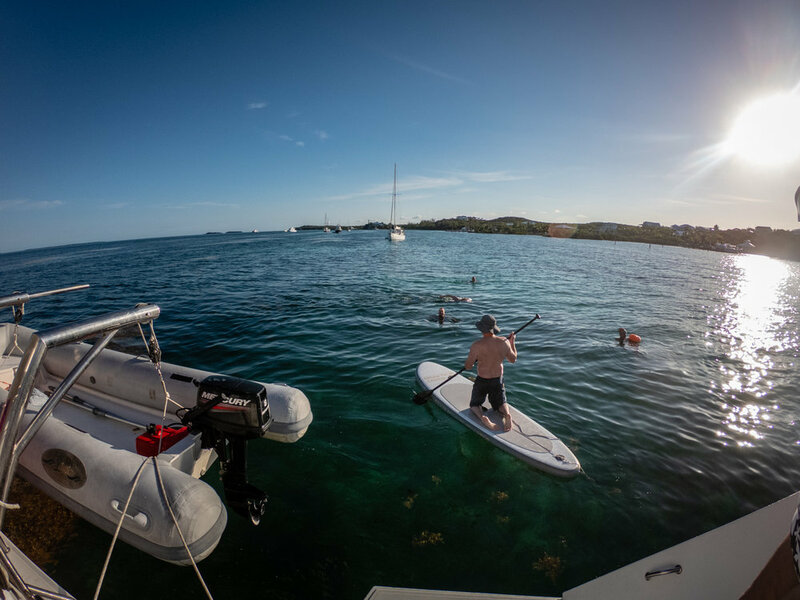 The SUP has been such a useful tool for us, giving our guides a great view of our swimming courses, the guests, and other boats. It also allows other boats to see us. Compared to a dinghy, you have better visibility, portability, no smelly engine exhaust, and a more elevated point of view, though you trade some speed and it’s tough to use in strong winds. From this vantage point this morning, I could see a big raft of sargassum, a floating seaweed, and was able to guide some swimmers around it. 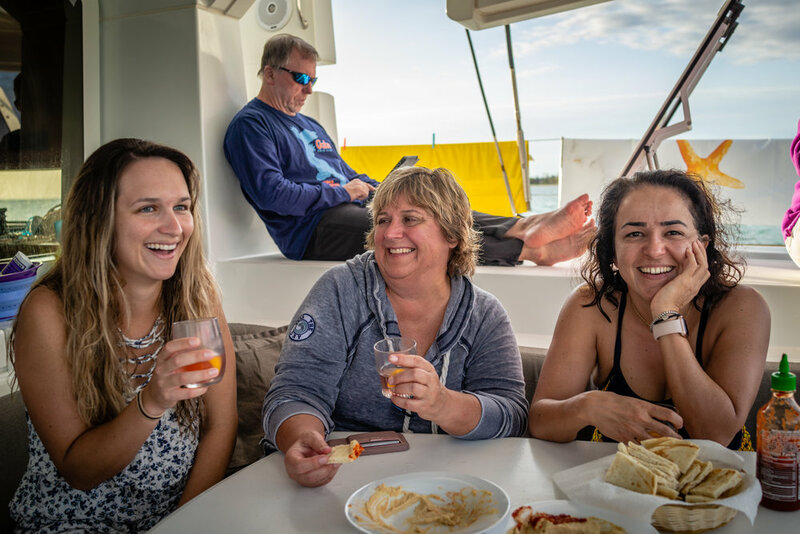 Back at our yacht Cataventure, Heather donned mask and fins to take video our our guests’ strokes, then we yanked the anchor and headed out into the Sea of Abaco, destination: Foot’s Cay. 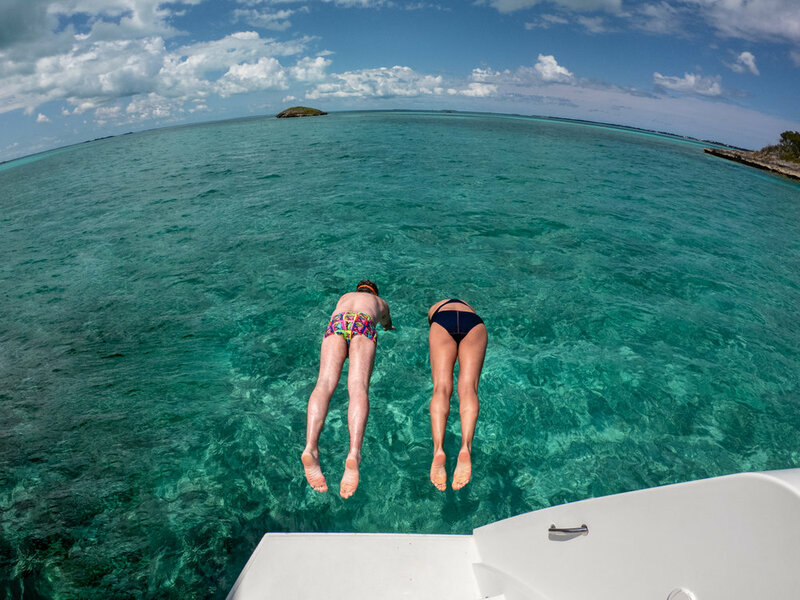 Most of the coral reefs down here are on the Atlantic side, but Foot’s Cay is a sweet little exception. We snorkeled around one of these little islands, and the reef life was all there; hard and soft corals, baby fish nurseries, schools of bigger fish. A grouper hid inside a cave. A few Lion-fish, which is an ornately feathered creature, but also an invasive species from the Indopacific. Twenty years ago, a handful of these buggers were set free from a tank by hurricane Andrew. They have since taken hold in the Caribbean. Many island nations encourage spear fishing them, but we saw these two and moved on. SwimVacation is heavy on the vacation aspect of the trip, but we take swimming seriously, too. From the very first trip, I’ve felt that SwimVacation is a great opportunity for our guests to improve their stroke technique. 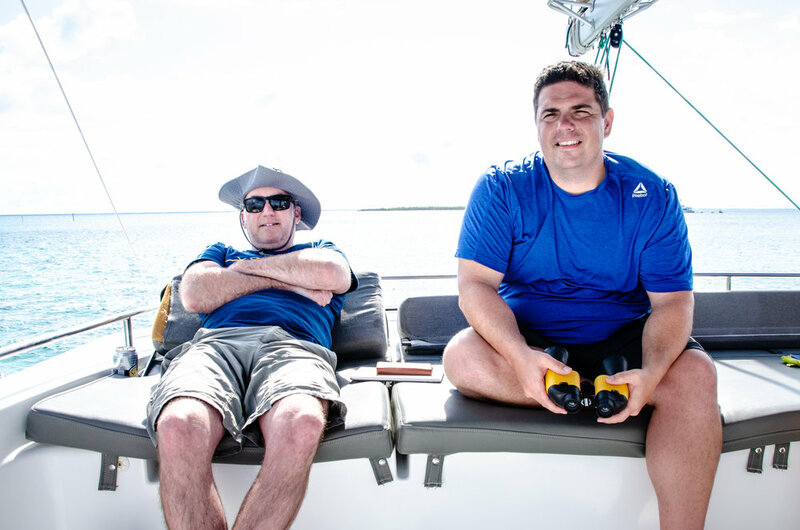 The combination of our excellent guides, most who are experienced stroke technicians, and long, smooth swims creates a situation where our guests can make huge leaps in their efficiency, speed, and in their ability to avoid injuries long-term. This year, we’re adding a new twist. Using an App called Coaches’ Eye, as our guides review our guest’s stroke videos, they can make notes, lines, and bullseyes right on the screen to emphasis different aspects of the stroke. They can also record the session, voices and all, and when it’s done, wrap the whole thing up and email our guests a link to their personal video session. I’m pretty excited about it, and hope it will provide a useful tool for our guests well after they return home. 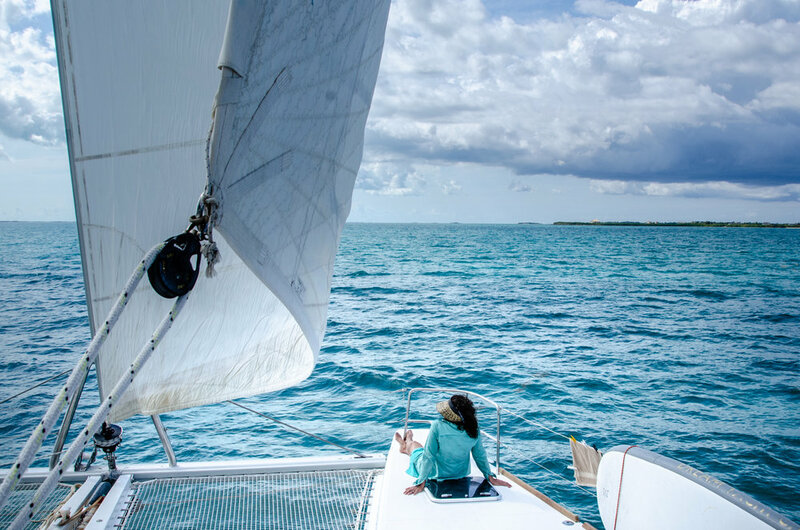 A pretty sail to Great Guana Cay enabled some reading time, conversation time, and most importantly, nap time. We filled up our water tanks at Orchid Bay Marina, where the dock guy is a friendly jokester. I love these interactions with the locals, they lend a lot to the experiences we have here. 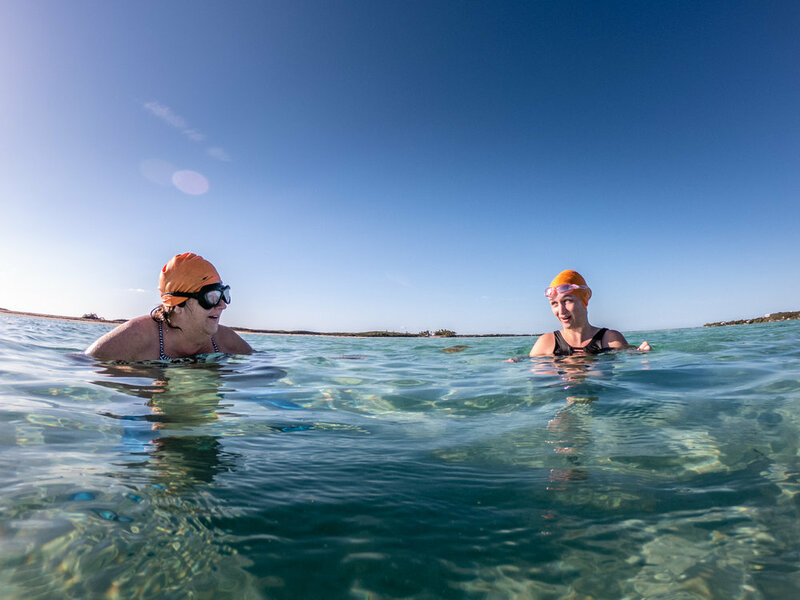 The wind picked up, and we had some decisions to make about our evening swim and anchorage, but wound up here in Baker’s Bay, Great Guana Cay. White sands lined with some very expensive though tasteful homes, many owned by celebrities. Gisele, is that you lying on the beach and your hair made of spun gold? 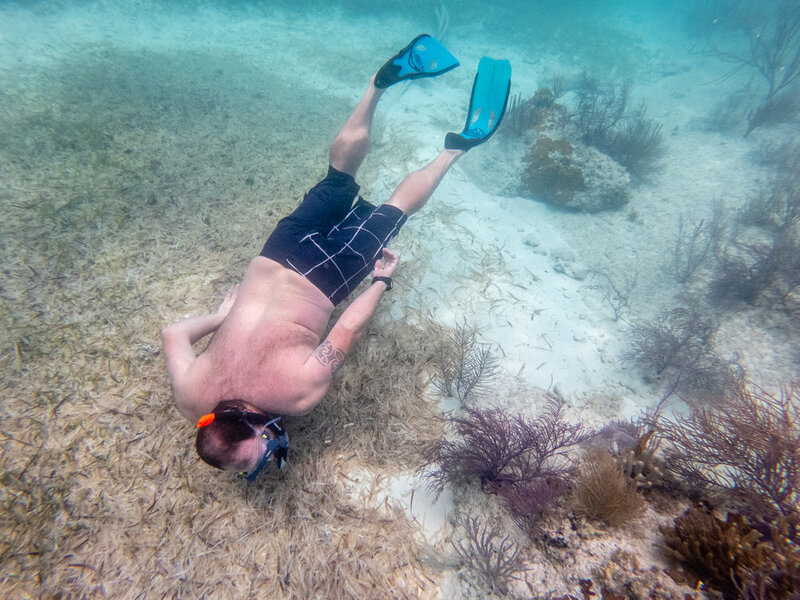 Where was I…….. uhhhh oh yeah we jumped in for a late swim. Sometimes we get guests with tons of potential in swimming, but have never had the opportunity to have their technique worked on and to practice it every day, twice a day. Lexi is one of those people, and this evening we got to see her stroke really come together, her efficiency and speed increasing exponentially, and joining the next fastest group. Everyone was proud, not least Marianne, her mom. It’s Zack’s birthday! April fool’s birthdays are amusing. Zack is our pro deckhand, so much so that the term deckhand doesn’t really cover all he does for us. Cocktails flowed and a party ensued after our swim. Simon found a pair of cheesy blueblocker sunglasses underwater this morning, and they made for a great accessory to some fun outfits. Guest Miriam dropped her phone overboard, and in typical fashion, Zack dove into the dark depths and found it. Rumor has it that the party went on well into the wee hours. I’m guessing a later start for our morning swim tomorrow. Richie and Hopper in an outfit that makes us all just a little uncomfortable…. Our sweet young Zack, aged 23. Happy Birthday brownie and a bottle of wine. Happy Birthday, Kid!